On the Road to Damascus: Do we really still need a Pope and a Magisterium? I am a gun guy. I have enjoyed shooting and teaching others to shoot for over thirty years now. There are many factors that go into being able to hit the target accurately. Proper breathing and trigger control are important but if I do not have a good sight picture I will miss every time. Even being just a tenth of an inch off can cause me to miss by eighteen inches or more at just twenty-five yards. Shooting old school with iron sights there are three parts that make up the sight picture – target, front sight, rear sight. All three must be lined up properly for the bullet to have any chance of accuracy. The human eye cannot concentrate on three things at one time so all focus it set on the front sight. It is placed on the target where I want the bullet to go and then the rear sight is brought into alignment. If I do everything right my bullet will fly true along the path I have selected. Our spiritual life can be thought of in much the same manner. Our target is heaven. Jesus is our focus, our front sight. Our rear sight is our religious instruction. The bullet is our life and the path it follows is our faith. The devil will do anything he can to keep us from hitting our target. One of his tricks is to get us to turn our focus off of Jesus. If we do not have Jesus as our front sight, our focus, we have no chance of hitting our target of heaven. The devil can also succeed by moving the rear sight. Even if moved just a little it could cause us to miss the target entirely. Remember, the rear sight is our religious instruction. Catholics believe that the Catholic Church has the fullness of Christian truth. We believe that the teachings we have come directly from Jesus, handed down through time by the successors of the original twelve disciples. Jesus taught the twelve who taught their disciples and so on. In the mid-fifteen hundreds there was a Catholic priest who did not agree with everything the Church was doing. You know him as Martin Luther, father of the Lutheran church and Protestantism. Martin Luther was absolutely correct in pointing out the abuses of power the Catholic Church was committing. It was necessary in stopping the abuses. He was absolutely wrong to use it as an opportunity to stray from Church teaching and introduce his opinion as doctrine. Luther removed books from the canon of scripture that he thought were there in error and he wanted to exclude others because they did not support his way of thinking. He went further by adding things to scripture that he thought were missing, most notably one word that created the Lutheran motto – "Sola Scriptura” - Scripture Alone. It was Luther’s way to throw out fifteen-hundred years of Catholic Tradition and teaching and make the bible the sole source of instruction, which he could interpret in a way that suited him. When Luther was asked why he had added the word “alone” to a particular phrase in the bible he answered that Luther did it and that should be justification enough. Probably the most destructive thing Luther did was when he changed the Mass from a sacrifice to an instruction of the faithful. He changed the Mass from being centered and about Jesus to being centered and about the congregation. It ceased being a Mass and became nothing more than a service with some nice bible instruction in it. What Luther did was open the door for anyone to interpret Holy Scripture anyway they saw fit to support any idea that may have had. As a result we have over 40,000 different protestant churches each teaching their own flavor of the truth. This greatly amuses the devil. All it took was a small nudge to the sights to get humanity off target. There are not 40,000 “truths”. Jesus said, “I am the truth, the way and the life.” The only truth is that which Jesus taught his disciples. As Catholics we have the Magisterium. The Magisterium is the Pope in communion with all of his bishops and is the teaching arm of the Church. They have the responsibility to ensure that we receive the teaching that Jesus gave to his disciples. They have the responsibility to ensure this teaching stays true to the teaching of Christ and that it is not corrupted by any person or group of people over time. 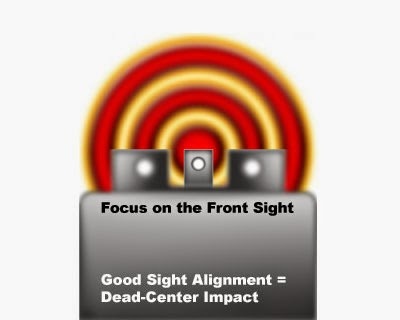 In short, it is their responsibility to ensure that we keep our sights properly aligned. Other Christian religions cannot make this claim, in fact, they claim that they do not need such a thing. They say that the bible is self-interpreting and each person can come to the correct meaning on their own. That works so well that we have seen churches split in half when their two ministers can’t agree on what the bible says among themselves. So do we really need a Pope and a Magisterium? I for one am extremely grateful that we have them.